TAKAJO, Miyagi Pref. — Rescue workers used chain saws and hand picks Monday to dig out bodies in devastated coastal towns, as the nation faced a mounting humanitarian, nuclear and economic crisis in the aftermath of a massive earthquake and tsunami that likely killed thousands. Millions of people spent a third night without water, food or heating in near-freezing temperatures along the northeastern coast as death estimates continued to rise. More than 10,000 people are estimated to have died in Friday’s tragedy, which is causing hardships on a scale that hasn’t been seen since World War II. In many areas there is no running water, no power, and four- to five-hour waits for gasoline. People are suppressing hunger with instant noodles or rice balls while dealing with the loss of their loved ones and homes. “People are surviving on little food and water. Things are simply not coming,” said Hajime Sato, a government official in Iwate Prefecture, one of the three areas hardest-hit by the double-headed disaster. He said local authorities were also running out of body bags and coffins. Sato said local authorities may ask foreign funeral homes to send supplies. The pulverized coast has been hit by more than 150 aftershocks since Friday, the latest one a 6.2-magnitude quake that was followed by a new tsunami scare Monday. Abandoning search operations, soldiers told residents of the devastated shoreline in Soma, so far the worst hit town in Fukushima Prefecture, to run to higher ground. Sirens wailed and soldiers shouted “Find high ground! Get out of here!” Several uniformed soldiers were seen leading an old woman up a muddy hillside. The warning turned out to be a false alarm. “This is Japan’s most severe crisis since the war ended 65 years ago,” Prime Minister Naoto Kan said Sunday, adding that Japan’s future would be decided by its response. Search parties arrived in Soma for the first time since Friday to recover bodies. Ambulances stood by and body bags were laid out in an area cleared of debris, as firefighters used chain saws to clear an indescribable jumble of broken timber, plastic sheets, roofs, twisted cars, tangled power lines and household goods. Helicopters buzzed overhead, surveying the destruction that spanned the horizon. Ships were flipped over to land on nearby roads, a half a kilometer inland. Officials said one-third of the city of 38,000 people was flooded and thousands were missing. Police in Miyagi Prefecture say more than 10,000 people are likely dead in their area alone. 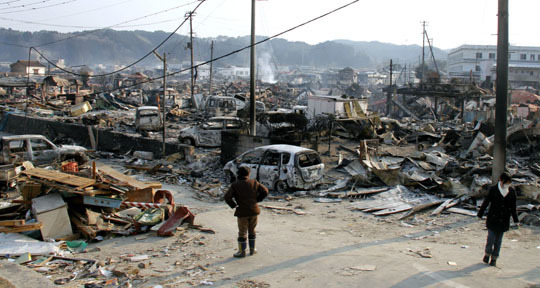 Miyagi, with a population of 2.3 million, was one of the hardest-hit areas. “I’m giving up hope,” said Hajime Watanabe, 38, a construction worker who was the first in line at a closed gas station in Sendai, about 100 km north of Soma. Just then, an emergency worker came over and told him if the station opens at all, it would pump gasoline only to emergency teams and essential government workers. He said he was surviving with his family on 60 half-liter bottles of water his wife had stored in case of emergencies like this. He walked two hours to find a convenience store that was open and waited in line to buy dried ramen. The government has sent 100,000 troops to spearhead the aid effort. It has sent 120,000 blankets, 120,000 bottles of water and 110,000 liters of gasoline plus food to the affected areas. However, electricity will take days to restore. At least 1.4 million households have gone without water since the quake struck and some 1.9 million households were without electricity. One reason for the loss of power is the damage to three nuclear reactors at the Fukushima No. 1 power plant. Operators are dumping seawater into all of the reactors in a last-ditch attempt to cool their superheated containers and prevent a meltdown. If they melt, it could result in an airborne release of radioactive material. On Monday, the containment building of the second reactor exploded, just as -the first one had Saturday. Their containment vessels, however, were not breached. 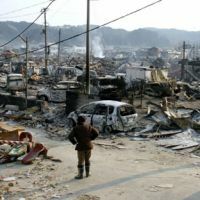 More than 180,000 people have evacuated the area in recent days, and up to 160 may have been exposed to radiation after the first blast. Preliminary estimates put repair costs from the earthquake and tsunami that struck Friday in the tens of billions of dollars — a huge blow for an already fragile economy that lost its place as the world’s No. 2 to China last year. In the town of Minamisanrikucho in Miyagi Prefecture, 10,000 people — nearly two-thirds of its population — have not been heard from since the tsunami wiped it out, a government spokesman said. About a third of the town of Soma was wiped out, with several hundred homes washed away. Three districts of town on the shoreline are now covered in rubble, overturned cars and trucks and waist-high, dirty green water. A tiny pink girl’s bicycle, all twisted up, sits near a child’s backpack — just some of the personal belongings littering the landscape. Atsushi Shishito sat in a daze on the concrete foundation of his home, now completely washed away. He sleeps at an evacuation center. The 30-year-old carried his grandmother to higher ground to escape the tsunami.